Boot Hill, Knott's Berry Farm, 1990. Photo courtesy Orange County Archives. Love Halloween? Love theme park history? Boy, have I got the event for you! Join the Orange County Historical Society and authors Ted Dougherty and Eric Lynxwiler for some Halloween fun and holiday history on Thursday, Oct. 8, 2015, 7:30 p.m. at Trinity Episcopal Church, 2400 N. Canal St., in Orange. This event is open to the public at no cost. Halloween is now a multi-billion dollar industry. Yet long before costume-shop chains and Halloween stores cropped up every October, the Halloween season was far more innocent and simple. Many remember when the season entailed trick-or-treating in home-made costumes among a few illuminated porch decorations. That all changed in the 1970s when Halloween's popularity began to explode. One of the pioneers of the now-global Halloween industry was Orange County's own Knott's Berry Farm. Take a trip back in time with authors and historians, Ted Dougherty and Eric Lynxwiler as they share how the family-friendly Knott's Berry Farm theme park was at the forefront in creating a spooky form of entertainment that has been emulated at theme parks around the world. Ted Dougherty is a historian and author of the award-winning book, Knott's Halloween Haunt: A Picture History. 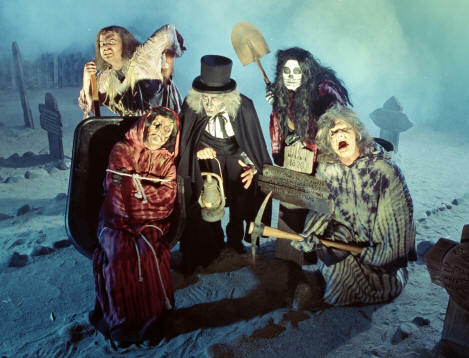 In addition to scaring thousands of guests for ten seasons as a "werewolf" at Knott's, Ted has also consulted, provided historical tours and trained characters for the longest running Halloween theme park in the world, Knott's Scary Farm's Halloween Haunt. Due to his expertise of things that go bump in the night, Ted has worked as an Associate Producer for the documentary, Season of Screams, and featured in numerous media outlets, including Newsweek, the History Channel and CNN. Urban anthropologist J. Eric Lynxwiler is the co-author of Knott's Preserved: From Boysenberry to Theme Park, The History of Knott's Berry Farm, and Wilshire Boulevard: Grand Concourse of Los Angeles. Neon enthusiasts may know Eric as the affable host of the Museum of Neon Art's Neon Cruise. Downtown L.A. preservationists know him as an L.A. Conservancy docent for the Broadway Theater district. While attending UCLA, he spent one school year behind the counter of Knott's shooting gallery and, more recently, worked as theme park's graphic designer on signage, brochures, and its new series of Berry-Market-labeled preserves.